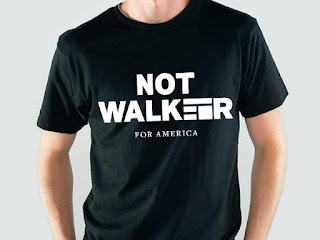 UNINTIMIDATED: Wisconsin Musicians Against Scott Walker: We've Got T-Shirts. Or, More Accurately, We WILL Have T-Shirts. We've Got T-Shirts. Or, More Accurately, We WILL Have T-Shirts. So, you've been saying to yourself, "self," you says, "i'm really into this whole UNINTIMIDATED project, and i'd really love to help them get this thing produced, but how? I am but one person! Oh, if i could only help them in some way!" Today, we're launching the BandCamp site for the UNINTIMIDATED project: unintimidatedscottwalker.bandcamp.com. This is where the DVD/CD/zine and download will be sold online, but for now, we're hoping to raise some funds for the pressing by moving these sweet shirts. Because we're trying to keep costs manageable, we're running this like a pre-sale. We'll take orders through the end of every month, then that month send them to our printer to run them off and send them to us. So please be patient with regard to shipping time! Hopefully if these take off we'll be able to stock some eventually, but for now, we'll be printing them to order in monthly batches. Expect them to ship around the mid-month after you order. And who's doing the printing, you ask? Our man Scott at Hype Screen Print in Detroit, MI! They'll be printed on sweatshop-free Tultex shirts and will be available in unisex and women's sizes, white ink on black shirts. All proceeds from the shirts will go toward the pressing of the UNINTIMIDATED DVD/CD/zine, and everything this project raises above costs will go to charity.